I came out of the show jumping ring with a huge grin on my face, saying, "Well...we got it done. We always get it done." strong trot in, hang a right, make a serpentine past a fence so he knows why we're there, pick up a collected canter, head to fence 1 (above.) As usual, he was sticky to fence 1 and then jumped up instead of across. It's our jam. 2 was on an angle, and he didn't even give the gate a look, which IS PROGRESS PEOPLE! REAL PROGRESS! This is the last time we jumped a gate, and we broken shopping cart'ed it right down to the base and then leapt it like there were lions down there. Cruising to 3. They waived coats and I don't own a short sleeve show shirt, so it got real jumpery in there between the bonnet and my only show shirt, the printed collar Kingsland shirt I scored for $15 (thanks, Austen). 3 is JenJ's favorite, because the fence matches her bonnet. 4 was deceptive. To me, I thought it would ride scary far away and normal up close. Connor thought the exact opposite and jumped it huge. Delightful equitation here, though to be fair, my equine partner didn't exactly make this one easy on me. He was pretty tense and as a result, picked up the cross canter to five. Our only rail in recognized SJ so far was at FRV when he cross cantered to a fence, so my score-protecting brain said NO NO NO NO and I went for a lead change, but we are slow at them, so it happened really close to the fence. My trainer said I was too close to do that, in retrospect, but I did it. He rubbed it so hard I thought it fell, but it didn't! Magic. The only way you can tell in the picture is he didn't get his knees up as high as he normally does. My fault. I think he rubbed it with a hind foot, because he definitely cleared it with his front end. He landed cross cantering after 5, so I fixed it again, and we almost trotted 6? Or we did trot 6? It's a little dangerous that I know that Connor can/will jump and clear whatever I point him at even if he's giving it the hairy eyeball. 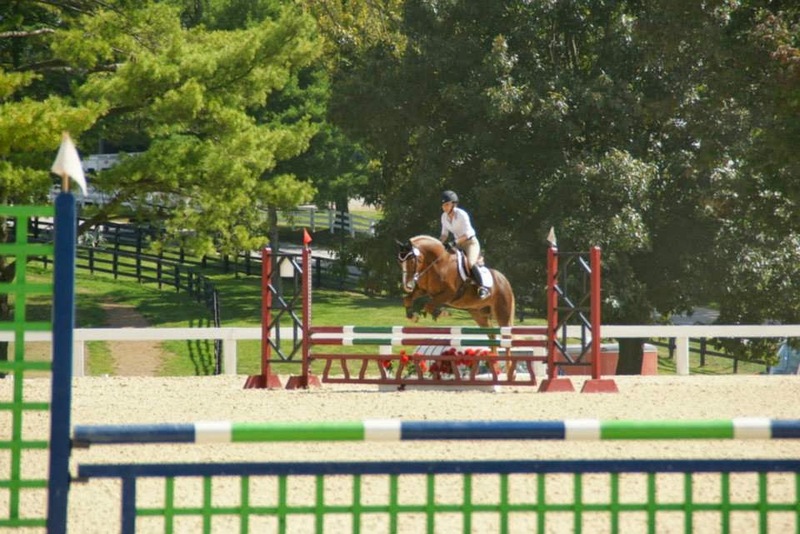 He just does not like to hit fences AT ALL, and is athletic enough to get over them from most anywhere at this height. It leads me to make bad aggressive decisions in SJ. That's not really a good thing. 7 and 8 rode really well, he always pulls it together for the second half of every course, although he was still tense. Also, it was about here that I realized I should probably think about time after two clunky simple lead changes, and apparently it was obvious enough that my trainer noticed. Then there was 9, the last fence. He's usually so good by the last fence, but not this time. My trainer had warned me that he might look at the rails sitting on the ground on the rail about 30 feet in front of 9, ready for the next division. I didn't disagree, but didn't think they'd cause him that much of a problem. Well, they did, and this is the only fence he rode like a broken shopping cart to. But the picture is magnificent. Go figure. 50 years from now someone will look at this picture and say "My, what a willing, beautiful pair!" without knowing what led up to this picture. Haha! In the end, they don't give eventers style points, and we did leave all of the jumps up and came home under time. The person I was tied with had a rail, so that left us as the overnight leaders, and me with the odd feeling of knowing that my fate the next day was ENTIRELY in my hands. Come home clear and win, no relying on other people to mess up. For someone used to looking up in the standings, it was a new feeling. You seem to have broken this down well. Love all of the pictures! You mean excessively well right? Haha. I am way too specific in recaps, but it is nice for me to look back on when the next event is coming up. I love the play by play and all the pictures! Because I live vicariously thru all you eventers :) So...how did you sleep Saturday night? I'm glad! I slept pretty well, but I was up for a while thinking about making it around that course under time. I was convinced we were going to have some time penalties and I rode the course several times in my head trying to figure out how to cut some time off. Hehe, leave it to our ponies to always keep us in line! Connor looks fantastic, as do you! Thanks! Yep, safely first, then cleanly, and definitely in a way that won't scare Connor - I don't need any more of that. Haha. Yay for you! Also, as you pointed out- there are no style points and it's sure as anything not a hunter show, so quick thinking and aggressive riding are not the worst skills for an eventer to have! Not that we don't want to have tactful rides, but still! Thanks, and true! I do want a smooth round, but I'll take clean over smooth. Oooo the suspense (even though I know you won). The picture of him cantering in the middle of this post made me squee out loud. Y'all are the cutest jumper pair ever and also a force to be reckoned with! Thanks! Tiniest jumpers! He did beat out 12 full sized horses this weekend. LOVE the picture of you cantering to fence 3, and then of course fence 3 itself (because really, matchy-matchy). Great recap of the ride, and well done! Yes really, matchy matchy. We get matchier all the time. I feel like that 2nd to last picture is from a brochure or something! So cute! Thanks! It's my favorite one for sure. Love the write up!! So fun to watch your little guy develop with you. Rubbing a rail is so unlike him he usually is a no touchy boy! As always you two are a great team! I know, that one was part my fault and part his. Thanks! You write really good recaps, and the pics are great! Congratulations! Go Pony!!! Love it. You both are on the right track and will only get better with time. Congrats. I love how he jumps! You guys look great and good job! Haha, thanks, he is a ROUND jumper. Thanks! Yes, it's not about style, it's about leaving the fences up. Well done! And extra well done and suddenly thinking TIME? That would never ever have crossed my mind! I rode a little differently knowing I had the lead, that's for sure. Thanks! Such nice form over those! I am constantly reminding myself that eventer a don't get style points whoever I see pics of myself jumping lol. My equitation is very much a work in progress. I figure it will come with lots and lots of practice and instruction (I hope). Great photos and play by play! Good for you! Good equitation really does matter, but it also does come with time.